1.1.2 dwg – AutoCAD Drawing. 1.1.3 dxf – AutoCAD Drawing Interchange Format. 6.0.1 Two Question should mind before start design? 6.3.2 What is Gerber Format? 6.3.3 Why Use Copper in the PCB Design? 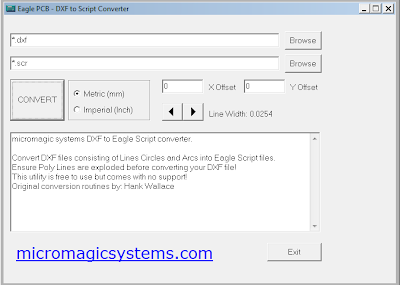 dxf – AutoCAD Drawing Interchange Format. Libraries – All of the parts that you place on your designs are stored in libraries. Each part will contain a device, symbol, and package. Devices. Within every library, you’ll have one or multiple devices. These devices include both a schematic symbol and a package in one accessible location. Symbols. Within every device, you’ll have a symbol, which provides a visual representation of a part for use on a schematic. Packages. Within every device, you’ll also have a package, which is the physical representation of a part for use in a PCB layout. Pads. The pads are the red rectangles on this part and are numbered according to your datasheet. When placed on a PCB, each of these pads will be connected to a trace and provide electrical connectivity for a part. Package Dimension. The package dimension is the rectangular gray outline that you see connecting all of the pads. This outline represents the actual physical dimensions of your part can help during your PCB layout prhttps://www.autodesk.com/products/eagle/blog/wp-content/uploads/2017/03/package-numbered.pngocess to see if you’re placing components too close together. Silkscreen Outline. The silkscreen outline is the rectangular yellow lines lying over the gray package dimension lines. While this piece is optional, it helps to provide a visual indicator for your manufacturer when they are assembling parts on your bare board. 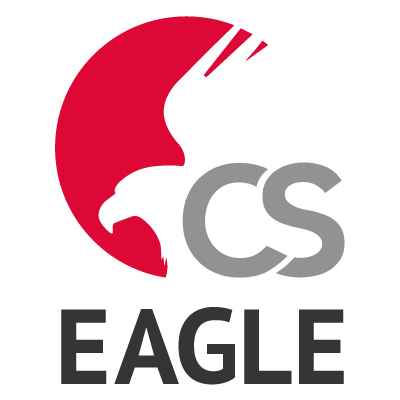 SparkFun Eagle Libraries – SparkFun’s Public Eagle PCB Footprints using Eagle 6.0+ or greater. 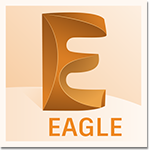 Open a Eagle application and you can see the control panel. Now that your library is saved, you just need to activate it. Go back to your Control Panel, right-click your new library, and select Use. You’ll know if your library is ready to go if it has a green dot next to it in your Control Panel. Note : if you are a library creator you should know the each detail of device like foot print and everything. refer datasheet. 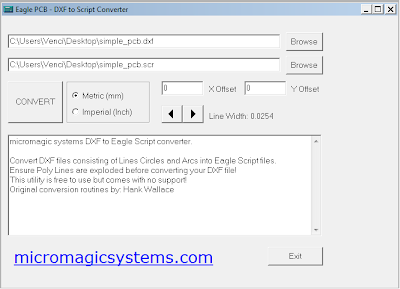 DXF2SCR Converter – a FREE utility to convert DXF files consisting of lines circles and arcs into Eagle PCB script files which can then be imported into your PCB layout. Supports metric and imperial, X and Y drawing offset and line width. DXF polylines need to be exploded before importing. Output is placed on the Dimension layer. Now what you need is to save the drawing to DXF format by going to Save As and chose AutoCAD 2004 DXF form the Files of type drop down menu. Name your file and save it. Load the file and hit convert. You need to provide destination for both input and output file. Now you go to EAGLE PCB and select File -> Script. Find the SCR file and open it. Now you should see the exact same PCB form the AutoCAD drawing. However you will need to place holes and drills. Those you see now are drawn on the Dimensions layer AND WILL NOT FORM ANY ACTUAL DRILLS. Here is a trick that helps me dealing with this. After the import you need to zoom in to the center. Turn your grid on (I use dots) and carefully align the center of the hole and the marker. Take note that after the import the grid is set to Finest(which is 1 mil) You might need to use the Change command to make the lines 0 mils in width. It’s easier to see the grid this way. Now use the move command to get the hole or drill. The holes are usually placed on the schematic so they have names like H1, H2 .. etc. To grab the hole just type its name in the command line. It is a tricky job but with some practice you will get used to it  When you are finished aligning the holes you can delete the markers. Now you change your grid back to normal. Yellow TTP (Toner Transfer Paper). Thermal Heat Transfer Paper For PCB Circuit Board Iron Prototype. Photo Glossy paper Laser paper. Do You Know -How To Create Circuit Boards? To create a PCB Design you need to draw holes, pads and wires for your circuit. Then you send this drawing to a manufacturer or you etch it yourself. This tutorial will help to know A-Z about PCB Design. PCb’s are designed on a specialized electronic design automation(EDA) or a computer-aided design (CAD) system. Two Question should mind before start design? What is the size of PCB? Gerber format is an Open ASCII vector format for 2D binary image. It’s the de facto standard used by printed circuit board industry software. Why Use Copper in the PCB Design?